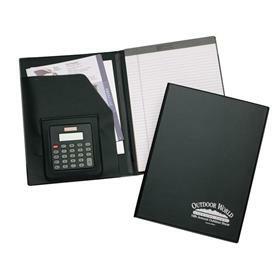 Our 9" x 12" Budget Portfolio has an inside pocket for storing papers in addition to business card slots. It comes with a paper pad and pen loop. The calculator is not included. Available in twenty eight material colors for your next event.